[W]e have an intriguing natural economic experiment. Two large, advanced economies are both undergoing fiscal austerity from spending cuts and tax increases. But one is recovering, though glacially, from a previous downturn; the other is deteriorating. The likely difference: monetary policy. Not only did the Federal Reserve slash short-term interest rates to nearly zero way back in 2008, but it has also embarked upon a massive bond-buying program known as quantitative easing. The European Central Bank, however, only last month cut its key interest rate to 0.5 percent, still higher than the Fed-funds rate. And the ECB’s “unconventional” monetary policy has been far more modest, with bond purchases less than a tenth the size of the Fed’s. Its goals have also been more limited: stabilizing southern Europe’s debt markets and avoiding a financial crisis. At a recent speech in Frankfurt, Germany, St. Louis Fed president James Bullard said that unless Europe adopts an aggressive bond-buying program, it risks an extended period of low growth and deflation like what Japan has experienced since the 1980s. What is puzzling to me is how anyone could look at the outcome of this experiment and claim the Fed's large scale asset programs (LSAPs) are not helpful. Some claim the LSAPs are just helping the rich, at best, and may even be deflationary. But it is not hard to imagine how much higher U.S. unemployment would be were it not for the Fed's QE programs. Just look to Europe's unemployment rate, as noted by Pethokoukis. Yes, the LSAP programs are far from ideal but they are keeping Americans from experiencing the unemployment seen in Europe. In other words, QE is helping the lives of ordinary working people in the Unites States. And there are many ordinary working Europeans whose lives would be much better off if the ECB were to more closely follow the Fed's actions. The insights from this natural experiment should give QE critics pause. And so should the fact that these these programs are helping shore up the supply of safe assets. Critics who see the slow recovery and point to the Fed's LSAPs simply are not doing the right (if any) counterfactual. The size of the ECB balance sheet is not very informative. A more relevant measure is the size of the monetary base. Whereas the Fed's monetary base has increased 245% since August 2008, the ECB's has only increased by 48%. This is due to the fact that the ECB is the only major currency area at the zero lower bound that has never done any QE. The only programs that involved actual purchase of securities were the Covered Bond Purchase Programmes (CBPP1 and CBPP2) and the Securities Markets Programme (SMP). CBPP1 ran from June 2009 to June 2010 and maximum impact on the ECB's balance sheet was 61 billion euro. CBPP2 ran from November 2011 to October 2012 and the maximum impact on the ECB's balance sheet was 16 billion euro. SMP ran from May 2010 until September 2012 and the maximum impact on the ECB's balance sheet was 209 billion euro. However, none of these programs were considered QE. "Question: One question for clarification because I obviously mistook something for what it isn’t. When I heard about this covered bond programme, I mistook it for quantitative easing. Can you explain to me why it isn’t? Trichet: If I might use our own vocabulary, it is part of our “enhanced credit support” operations. We have used this expression for quite a long period of time because we consider all the non-conventional measures we have taken in connection with the refinancing of banks as enhanced credit support. If you wish, you could call that credit easing, because it is a way of improving the functioning of the market that had been affected particularly markedly by the financial turbulences." "Precisely in order to guarantee that the stance remains unaffected, we sterilise our interventions, as I have explained. The Securities Markets Programme should not be confused with quantitative easing. In simple words: We are not printing money. This confirms and underpins our commitment to price stability." The liquidity created through Outright Monetary Transactions will be fully sterilised." The bottom line is that the ECB has never done QE, nor does it have any plans to do QE (so far). In addition to what Mark S. said above also note that the figure shows total assets as a % of NGDP. That is a misleading indicator because Eurozone NGDP has been growing much slower than US NGDP. You would really want to look at full-employment NGDP. That is why, for example, many observers look at budget deficits as a % of potential GDP. Mark's point is correct in that the mechanism of LSAPs is quite different in Europe. The ECB lends money--reserves--to banks, and banks buy sovereign bonds with that money. The end result is the same, whether one refers to it as a "hot potato" or "portfolio balances" effect. Saying, "the size of the balance sheet does not matter" is like saying, "the ECB is not impacting risk asset prices through its balance sheet". A look at the performance of the Euro Stoxx 600 would dispel that notion. Yes, the LTRO was reversed, but this did not have any impact on risk asset prices at the time (given the OMT "Chuck Norris" effect). "Sterlilization" is irrelevant in the presence of excess reserves. Like Operation Twist, there is no difference between selling T-bills in exchange for an asset and issuing reserves when those two instruments are substitutes. Further, true sterilization does not result in balance sheet growth. David is correct in pointing out the denominator effect, but I doubt the calculation would look much different if one adjusted for that. Lastly, I would note that the IOR in the EZ is zero in contrast to 25bp in the U.S. This is "easier", at least according to monetarists that have been calling for a zero U.S. IOR for years. I said "the size of the balance sheet is not very informative" because the ECB has always had a lot of liabilities that are not part of the monetary base. On average from February 1999 through August 2008 only about 63% of its liabilities were part of the monetary base. This is in contrast to the Federal reserve where the corresponding figure is 93%. The most recent figures for each institution are 51% for the ECB and 91% for the Fed. In short whereas the size of the balance sheet is a fair approximation of the size of monetary base in the case of the Fed, it is nearly twice the size of the monetary base in the case of the ECB. In the Fed's case the additional liabilities are: 1) reverse repurchase agreements with foreign official and international accounts, 2) non-reserve deposits 3) liabilities associated with Maiden Lane, etc. In the ECB's case the additional libilities are: 1) revaluation accounts, 2) non-reserve deposits, 3) current accounts and deposits with the Eurosystem held by central banks, other banks, international/supranational institutions and other foreign depositors, 4) current accounts and liabilities under repo transactions which are usually investment transactions using foreign currency or gold, 5) paid-up capital, legal reserves, other reserves and retained earnings, 6) counterparts of special drawing rights allocated by the IMF, etc. These liabilities have almost nothing to do with monetary policy and the ECB has a lot more kinds and quantities of such liabilities in part due to the fact that the eurozone is an international currency area. As far as the European Stoxx 600 index goes, it is not very representative of the eurozone as it also represents companies in Denmark, Iceland, Norway, Sweden, Switzerland and the U.K. A more appropriate stock index would be the Euro Stoxx 50 index which represents only companies of countries that are eurozone members. It is surprising to me that the Euro Stoxx 50 index is up since July 2012 when the ECB's monetary base began to shrink. But on the other hand this underlines why LTRO should not be considered QE. The fact that it had to be paid back was probably already priced by the market. More importantly whereas both the S&P 500 and the Euro Stoxx 50 dropped more than 50% from 2007 to 2009, the S&P 500 is currently in record high territory (as is the DJIA) unlike the Euro Stoxx 50 which is still nearly 40% below the peak level it attained in 2007. "Further, true sterilization does not result in balance sheet growth." Sterilization does not result in *monetary base* growth. Whether it results in balance sheet growth is entirely besides the point, although I doubt that is the case either. And in fact neither CBPP nor SMP resulted in monetary base growth and nor will OMT provided it is ever implemented. However LTRO apparently did increase the monetary base, but again this was done within a specific time frame and thus constituted Credit Easing and not QE. Also, I don't think even taking the ratio of the monetary base to potential GDP is very informative in this context as it is the amount of monetary base expansion relative to its pre-recession level that matters, and by that standard the ECB has done less than one fifth of the monetary base expansion of the Fed, and whereas the Fed is currently increasing its monetary base, the ECB is currently rapidly shrinking its monetary base. 2) U.S. stock indicies are in record territory whereas eurozone specific stock indicies are down nearly 40% compared to pre-recession peak. 3) Every one of the 17 countries in the eurozone with the exception of Estonia, Germany and the Slovak Republic has had a second or a third recession since 2008, the current eurozone recession just completed its sixth quarter of declining real GDP making it longer than the 2008-9 recession, and the gap between the Eurozone unemployment rate (12.2%) and the U.S. unemployment rate (7.6%) is now the highest in 13 years. The contrast between the economic situation in the eurozone and the U.S. could not be more stark. Lastly, whereas IOR is effectively an interest rate ceiling in the U.S. with the Fed Funds Rate target rate range, the Deposit Rate is effectively an interest rate floor in the eurozone with the Main Refinancing Operations Rate (MRO) above the Deposit Rate. Banks borrowing funds at the margin are borrowing at the Fed Funds rate in the U.S. (which is about 0.09%) and at the MRO rate in the eurozone (which is 0.5%). Thus peripheral banks in the eurozone are in fact paying a higher nominal interest rate to borrow funds than banks that are borrowing funds in the U.S. I think you miss the forest for the trees. What is the role of a central bank balance sheet? Its assets are purchased from the private sector, and its liabilities are issued to the private sector at will. A change in the central bank's balance sheet therefore creates changes private sector portfolios -- the essence of the "portfolio balances" and "hot potato" dynamics. I am arguing the ECB's moves -- including the "Chuck Norris" OMT effect -- have created essentially the same private sector portfolio dynamics as the Fed's LSAP. So here is a question: you draw a distinction between the "base" and other CB liabilities. What is the essence of that distinction? If the answer is "permanence", then are you arguing that reserves funding fixed-tenor Fed LSAPS are "permanent"? As for the contrast b/t EU and U.S. economic performance, that is exactly my point. Both countries/regions have central banks that targeted asset prices, but the performance did not correlate with those asset price movements. Therefore, the LSAPS -- an asset price effect -- do not explain the economic performance. Central banks can create base money (reserves and currency) at will. They cannot create reverse repurchase agreements, non-reserve deposits and liabilities associated with Maiden Lane at will. These liabilities are not base money and are not very relevant to the conduct of monetary policy. Incidentally the vast majority of non-monetary base libilities are associated with the public sector (e.g. the U.S. Treasury, the General Account, foreign official, international/supranational, other central banks etc. ), not the private sector. The OMT effect was very different from the effect generated by LSAPs. It was the absence of a negative instead of the creation of a positive. All the ECB did was openly state that it was willing to act as a lender of last resort (something which every other central bank on the planet does automatically) provided the governments of member states were willing (under certain conditions) to ask for help. Given non-monetary base libilities have been a very important part of the ECB's balance sheet since the beginning, obviously "permanence" is not an issue. The distinction is in that they have no monetary policy role. Your last point about the difference in US and eurozone economic performance is totally incoherent. The performance of the stock markets in these respective currency areas largely reflects the economic performance of these respective currency areas. The U.S. economy is recovering and the eurozone economy is likely in its seventh quarter (almost two years!) of recession. The U.S. stock market is setting new nominal records and the eurozone stock market while up has a long long way to go. BTW, you can argue there are lots of distinctions between Fed and ECB policies: targets, signalling, efficient transmission across countries/regions. I just think the LSAP distinction is not particularly informative given the similarity in portfolio and risk asset price movements. Several points. It is widely recognized that the ECB has had tighter policy than the Fed. That is why even someone like St. Louis Fed President James Bullard, who doesn't think too highly of more QE in US,recently called for the ECB to do it. There are very few observers anywhere who will argue the ECB has been as accommodative as the Fed. In fact, most will say the in order of easing it has been the ECB, the Fed, and BOJ. And the real economic growth results coming out match these stances. Japan had over 4% real GDP growth Q1, its money supply is increasing, and risk premiums are falling there. This is the big picture. I am afraid you are the one missing the forest for the trees. Second, the denominator on balance sheet/GDP is huge here. Eurozone NGDP is about 16% below its full employment level, while the US NGDP is about 6%. But even this does not fully paint the picture. Even if they had the same monetary base/NGDP is still by itself would not correctly paint the stance of monetary policy. For money demand might be higher in region than the other. And in the Eurozone, the ongoing crisis implies it is dramatically higher. I argue balance sheet growth is a better measure of portfolio effects than base growth or QE. By that measure, the ECB has carried out a similar policy to the Fed's. 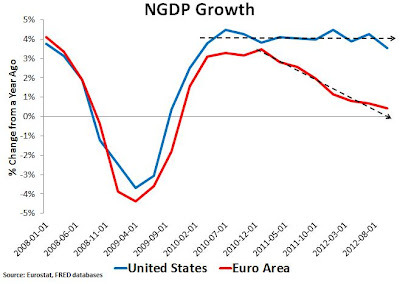 Therefore, the observed divergence in NGDP growth cannot be explained by different central bank portfolio effects (i.e. LSAPs). Its possible the ECB has fallen short in many other ways, but that was not the subject of your original post. The subject David's post was QE. The U.S. has done QE, the eurozone has not. End of story. European monetary policy makes sense if one considers the ECB to be an organ of the Bundesbank.